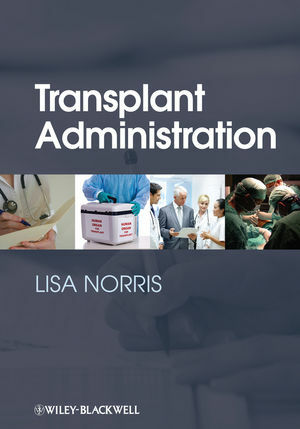 This timely new book, written by a transplant administrator with over sixteen years of experience, along with other expert contributors, covers the specifics of each aspect of transplant administration, providing information that will enable new administrators to quickly master essentials, help more seasoned administrators evaluate and improve their programs, and generally provide a knowledge base, focused on best-practices in light of regulatory requirements, for transplant surgeons, aspirant administrators and hospital administrators. Comprehensively covers all aspects of transplant program administration, including management, finance, staffing, quality improvement, patient intake, communication and collaboration with clinical staff, and more. Emphasizes practical application of best practices; uses bullet lists and other features to highlight essential information for each topic covered. Accompanying "Toolkit", available via the book's companion website, provides forms, a procedural manual, program assessment materials and more which buyers can use "out of the box" or adapt for use in their own program. While the book and its supplemental materials have been created specifically with the US transplant community in mind, they still have considerable value for transplant administrators and related professionals outside the US, for instance, transplantation and health policy researchers, hospital management staff who are tasked with starting a transplant program from scratch and who need ready-made materials they can adapt to suit their own regulatory environment, and others. Lisa Norris has over twenty years of experience in healthcare management and over sixteen years of experience in the field of transplantation. Most recently, she served as Director of the Christus Transplant Institute in San Antonio, Texas. Prior to that role, she was the Administrative Director at the Comprehensive Transplant Center at University of North Carolina Hospitals. She also served as the Transplant Product Line Director at the University of Maryland Medical System and the Director of Transplant Services at the University of Colorado. She has been a Region 8 administrator on the UNOS Transplant Administrator's Committee and has held various board positions with the Transplant Resource Center of Maryland, National Kidney Foundation, Medbank of Maryland and Transplant Council of the Rockies.